We’d love your help. Let us know what’s wrong with this preview of As Long as the Rivers Flow by Larry Loyie. To ask other readers questions about As Long as the Rivers Flow, please sign up. what is martha thinking about,what has happened to spider ? Jan/14 Each time I read this, I find new wonders in it - Loyie is such a nuanced and gentle chronicler of his childhood - and as always, when the soft green and brown watercolours are suddenly replaced by the stark black and white photos of Larry and his siblings at the Residential School they were forced to attend, a chill comes over me - while Larry survived, how many weren't so lucky! Short chapter book dealing with an indigenous boy's life leading up to the time he is taken away to residential school. As the book ends with him being loaded into the truck and his family's helplessness to keep him, it is a harsh ending, though foreshadowing shouldn't make it feel too out of place. Photos and an epilogue tell a little bit more about author Larry Loyie and his life. The book works primarily to create the sense of loss over what young Larry was losing. While he did make it back to Short chapter book dealing with an indigenous boy's life leading up to the time he is taken away to residential school. This is a very simple, bittersweet picture book. The lovely nostalgic artwork brings to life the story of the author’s last summer before he and his siblings were taken to a residential school. He has done a wonderful job of conveying the aboriginal culture, while giving a strong feeling of long summer days full of adventure that any child can relate to. The story ends with the heart breaking scene of the children being loaded into the back of a truck by strangers, who forcefully take them away from their home. Rather than focusing on the experiences of the residential school itself, this book focuses on what was lost. The cultural genocide of the First Nations people is a great tragedy of this dark part of Canadian history. This is a beautiful and accessible way to introduce children to a shameful period in our past. It is also a wonderful way to begin discussions on the importance of culture and how cultural diversity is valued and needs to be protected in our country. We need to read books like this with our children to ensure these kinds of acts are never repeated. An afterward shows photos of the author and his family at home and in the school system. This book is a wonderful choice to open up discussions of the residential schools in Canada. It doesn’t get into the abuses some children suffered, but does introduce the wrongness of the situation. The author doesn’t need to “tell” how wrong this situation was as it is easy for a student to recognize this through Lawrence’s experiences. This book is about the last summer of a family before they had to give up their children to send them to a residential school. The parents had no choice and could be jailed for failing to send their children. This practice happened in both Canada and the US from around the 1880’s for about one hundred years. Lawrence, his sister, and brother spend a great summer with his family. First, they rescue an abandoned owl and learn to take care of it. He watches family members sew moccasins and smoke hides for clothing. He goes with the adults in his family to the bush where they hunt and gather berries and plants. He even is there when his grandmother kills a grizzly bear with one shot. This is a good book for showing the importance of family to Native American families. The story is based on the life of the author, who was 10 years old when taken to the school. The illustrations are very expressive and help to tell the story. They are beautiful watercolors. This book is recommended for middle school students, or grades 5-8 to understand the customs and feel empathy for Lawrence and his siblings who are all younger. This review has been hidden because it contains spoilers. To view it, click here. I think it's a great example of what it was like back then! The illustrations and narrative really bring the story to life. It's more than just a story, though, because interwoven are the traditions that Lawrence learned as a boy, such as flipping the berries over so they would dry faster, and thanking the grizzly for giving up its spirit. I think this would be another great addition to a classroom collection. This is Lawrence just appreciating life as it should be. The ending detailing the residential school experience is a fairly generic description, I The illustrations and narrative really bring the story to life. It's more than just a story, though, because interwoven are the traditions that Lawrence learned as a boy, such as flipping the berries over so they would dry faster, and thanking the grizzly for giving up its spirit. I think this would be another great addition to a classroom collection. This is Lawrence just appreciating life as it should be. The ending detailing the residential school experience is a fairly generic description, I'm guessing because Loyie didn't want it to overshadow the book's true intention, to show what he lost by being forced to attend school. 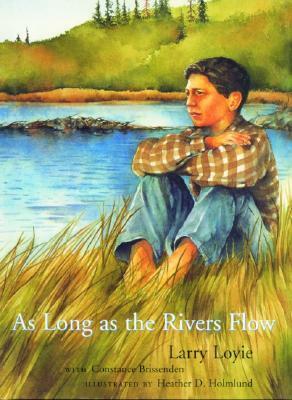 "As Long as the Rivers Flow" is an account of the author's last summer before he and his siblings were taken away to residential school. It was 1944 and Larry Loyie is ten, on the brink of learning from his extended family how to survive and live off the la This book is in a recommended reading list for Aboriginal Resources for young people. I decided that I would read all the books in the list -- for my own interest and simply to take a look at the reading information available to young readers. "As Long as the Rivers Flow" is an account of the author's last summer before he and his siblings were taken away to residential school. It was 1944 and Larry Loyie is ten, on the brink of learning from his extended family how to survive and live off the land. Loyie's account of his last summer before residential school is an excellent resource to learn about the life of aboriginal children and their culture. The book contains an epilogue with an account of Larry Loyie's life and accomplishments, overcoming his feelings of not belonging to become a writer. The epilogue contains pictures that really help the reader see these children as victims of an ill-conceived plan. A powerful story with wonderful illustrations about a family and their children at their summer camp before going away to Indian Residential School. As an Anishnaabe I would recommend this book to all readers as an act of reconciliation. Hear the stories. Build connection in the poignant retelling of this brutal time in Canada’s history. This was a beautiful story about a First Nations boy before he was sent to a government residential school. He writes about his last summer at home. He had a pet owl and observed his grandmother shoot a grizzly with a twenty-two. A lovely book. A vivid picture book/story of a young man's last summer before being taken to a residential school. An excellent resource for classrooms in teaching Treaty Education and supporting Truth and Reconciliation lessons. An excellent illustration of the closeness and culture that children were torn from when required to attend residential schools.